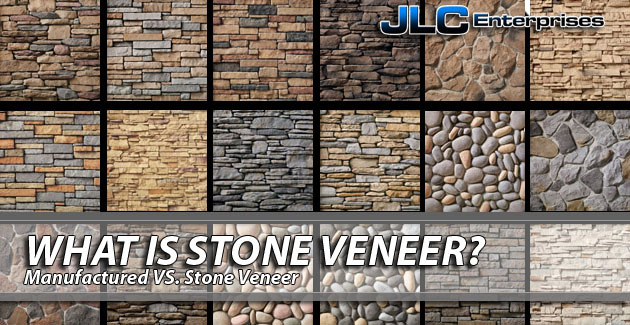 Are you searching for the answer to the question, “What Is Stone Veneer“? If the answer is yes, this post should help! Here we explain; what is stone veneer, material stone veneer is made from, how stone veneer is fabricated and advantages & disadvantages of stone veneer vs manufactured veneer. Stone veneer is a decorative and protective covering for interior and exterior surfaces and walls. This type of stone veneer is around one inch thick. It will also weigh less than 15 lbs/ ft2 or 73 kg/ m2 so that no structural supports will be needed. Stone veneer can be made from manufactured or natural stone. Natural stone veneer is made from stone that is collected or quarried. The stone is then cut the desired thickness and weight for a veneer. This stone veneer is called thin stone. 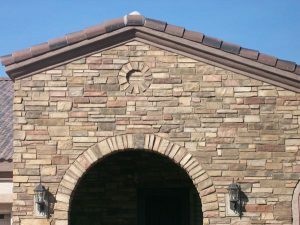 Manufactured stone veneer is created to look like natural stone. They are called manufactured stone, faux stone, artificial stone, flexible stone veneer, and stacked stone veneer are part of manufactured stone veneer. Manufactured stone veneer is made by pouring a lightweight concrete mix into rubber molds of various styles and then painted to make it resemble natural stone. The stone veneer is then created and attached to the wall with a special mortar. Flexible stone veneer is made by pulling a thin layer of stone from a slab of mica schist, slate or sandstone. It is then backed with a composite material. Great look for a hotel, home, office, etc. Manufactured veneer will be cheaper than natural stone, around half the cost of natural stone. It is light weight which eliminated the need for any footings or wall ties, and make it cheaper and easier to build. There are a variety of colors and designs that are available unlike natural stone, which is found locally where it is extracted. There are also some disadvantages for manufactured stone when compared to natural stone. It isn’t as strong so if it breaks or a piece is removed from the wall, unless it is replaced it will show. It isn’t reusable like natural stone. Manufactured stone has a large waste factor. Natural stone can be cut, chipped, and shaped to any size needed. The cut pieces are normally recycled to be reused while the manufactured stone cannot because it will expose the concrete it is made from. Then you will end up with areas that require small fill pieces that expose the edges. Manufactured stone often has lime in it which can seep out and stain the stone surface when the stone is exposed to water. It isn’t a naturally made product and because of the origin and painted exterior, it may change color due to exposure to UV rays and moisture. Manufactured stone is also porous so it will absorb a lot of water when compared to natural stone and it transfers moisture to the structure similar to improperly installed stucco. It is also subjected to freeze thaw issues and ice wedging. As water gets into the stone it freezes and chunks of the stone will pop off and leave an edge similar to a broken sidewalk. Repairs can be done, but they are quite expensive as the process causes the stone to be cut out and replaced and the repair does not stop it from happening again. Semi-light weight which eliminates need for footings or wall ties to make it cheaper and easier to build. Durability – real stone will not crack or fade over time and it can last for centuries. Aesthetics – it is made by mother nature, so it is better than manufactured stone. It has special characteristics that make it natural stone like moss, unique shapes, texture, etc. that cannot be done with man-made stone. There are disadvantages of natural stone such as the cost of materials. JLC Enterprises is considered one of the best builders and architects in the Phoenix Valley. Known as the most innovative and accurate stone installation contractors in Gilbert, Arizona and the rest of the Phoenix Metropolitan area. Give JLC Enterprises a call today at (480) 967-9183. Posted on May 23, 2017 May 23, 2017 Categories Stone VeneerTags Advantaged Of Stone Veneer, Manufactured Stone Veneer, Natural Stone Veneer, Natural VS Manufactured Stone VeneerLeave a comment on What Is Stone Veneer?